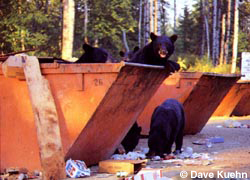 Bears feeding on garbage can quickly lead to problems. Bears can be attracted to establishments that have food because of odors and garbage. Bears become dependent on a food source. Move cans and dumpsters away from areas used by people. NOT STORE FOOD IN TENTS! Store food out of site in a car trunk or cabin. Rinse containers before disposal or recycling. These precautions will help reduce bear problems. When you find a system that works stay with it.